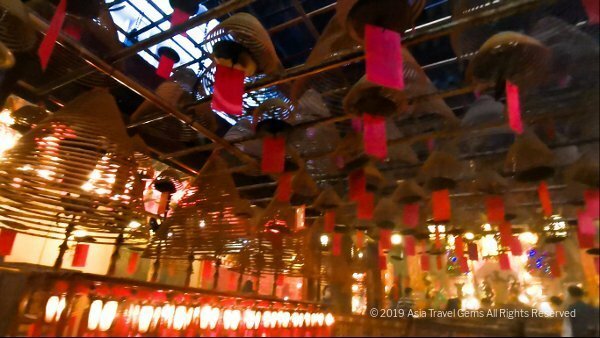 Things To Do in Hong Kong – Man Mo Temple – A Magical Sight! 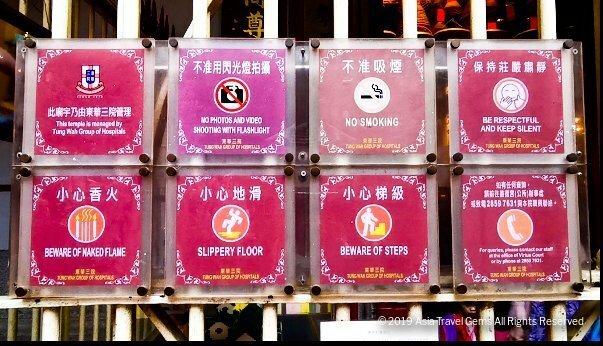 Today, in this post – Things To Do in Hong Kong – Man Mo Temple – A Magical Sight! – I would like to share with you this out of the world experience. If you have time in Hong Kong to visit only one temple, this must be the one! It was around 3pm. I had quickly stowed my luggage in my room at Butterfly on Morrison Boutique Hotel. After a quick organization of things to bring with me, I made my way to Causeway Bay MTR Station. From there, I would go to Central Station, then take the Mid-Level Escalators to Hollywood Road where Man Mo Temple was located. I was thrilled to be back in Hong Kong. It had been years since I was here. And this time round, I have done lots of research, and was better prepared to enjoy all the great food and soak in all the awesome sights! One of which is the famous Man Mo Temple. I truly enjoyed my time here. Keep reading as I share more about my magical experience here. Enjoy watching the video and the photos, too. In this video, you get to see the temple viewed from the street, the area outside the temple, and the mystical interior of the temple. Inside the temple, there is an awesome area in the center with beautiful lanterns and large incense coils hanging from the ceiling. Plus, you get to see the dramatic artwork, the altar, the drum and bell, the images of the gods, and more. Watch the video now! Man Mo Temple was built in 1847, and is one of the oldest temples in Hong Kong. It is also the largest Man Mo Temple in this city. 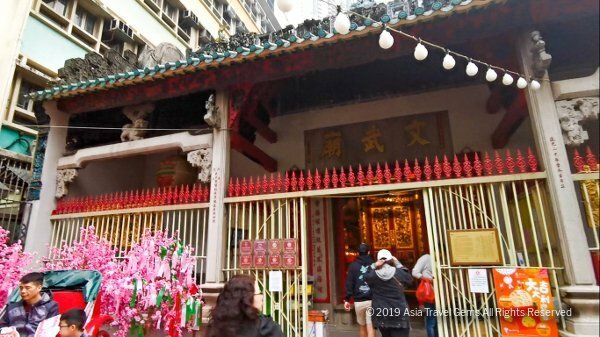 At this temple, many locals (and even tourists) pay their respects to the God of Literature (also known in Cantonese as Man – pronounced Mun) and the God of War (also known in Cantonese as Mo). From the ancient days till today, they pray for success in studies. This practice started in the days of Imperial China where scholars prayed for success in civil examinations. Their wish was to get appointed the best administrative positions in the state. Man Mo Temple is actually part of a complex. There are three adjacent blocks in this complex. And each house the following respectively – Man Mo Temple, Lit Shing Temple and Kung So. The main building is where Man Mo Temple resides. Today, the place of worship is managed by the Tung Wah Group of Hospitals. It has been given the title of Grade 1 historic building. And it is now preserved and declared a monument. From Hollywood Road, I walked into the courtyard of the premises. It was Chinese New Year period, and there was a display with pretty blossoms. You can see a bit of it at the left side of the photo below. As you can see from above, there is a gate where people walk from the courtyard, and into the temple. The large sign has the name – Man Mo Temple – in Chinese. Before you walk into the temple, do take note of the signs on the gate. These are some house rules to follow as well as some words of caution for your safety. Once past the main door of the temple, you will see these beautiful panels and pillars (photo below). The artwork and pillars are painted in red and gold, with Chinese words written on them. Look at the intricate details. I am always so impressed with such exquisite craftsmanship. Travel Tip: The original design of Man Mo Temple is completely preserved. This makes the architecture ancient and authentic. Further in, there are these decorative altars. They look like altars for the gods when they are carried outside for religious processions. Again, the details are so intricate and delicate. At the center of the temple is an area where there are gorgeous lanterns. The lanterns fill the space with so much light. The red paper hanging from each lantern is the name of a devotee who paid for it. This is to bless the person. Above the lanterns are large incense coils that are burning. Just like the lanterns, there is a red paper hanging from the incense with the name of the person who paid for it. The incense are continually burning. As the incense burns, the smoke carries the prayer of the person to the heavens. You can see more of all this in the video above. If you have not watched it, I highly recommend that you do. Along a side of the temple, there is a counter where prayer items are sold. 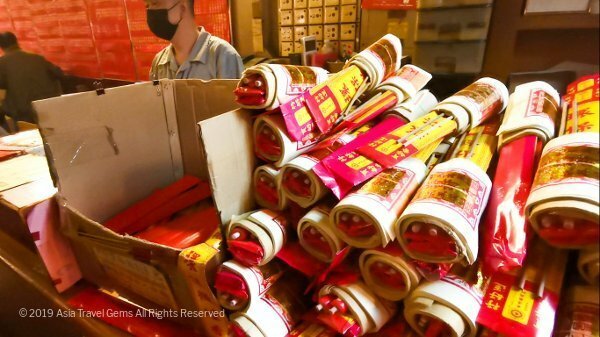 Here, people can buy individual items such as candles, incense, paper money, etc. Or they can purchase a prayer set that is specially prepared for them. You can see rolls of these sets in the image below. Even further in, just after the center space filled with lanterns and coils of incense, there is an area for people to do their prayers. It is here where the prayer items like candles are lit, and incense are burned and placed in incense holders. I ventured further in, and I discovered that we can get even closer to the altar where the God of Literature and God of War are at. There is an pretty cool small sculpture of a hand holding a pen brush. This is the tool held by the God of Literature. And just behind the pen brush are the God of Literature and God of War. I really like this photo. And I find the images of the gods and the altar so fascinating. Do you? The God of Literature is the one on the left. He is often depicted as holding a writing brush. The God of War is the one on the right, and wields a sword. Here are a couple of popular artifacts – the Drum and the Bell. Devotees are seen to say a prayer, and then strike the bell followed by hitting the drum. You can see them doing that in the video above. To be honest, I did not expect much when I planned to visit Man Mo Temple. But the site really surprised me. In an urban setting that is the bustling downtown area, you see this building that looks ordinary. But the moment you step inside the temple, it is like you are transported to another world. The scents of the incense, the bright and vibrant colors of the decor, the stunning lanterns, the coils of incense that seem to go on forever into the ceiling, and everything else – truly makes this a very unique and awesome experience. My advice – Yes! Do make time to visit Man Mo Temple. It is truly worth your time. 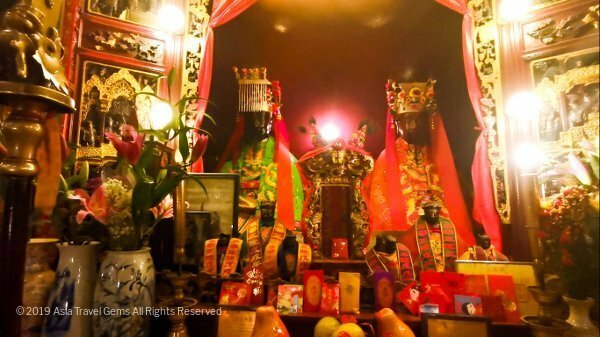 Where is Man Mo Temple? Man Mo Temple is located along Hollywood Road. This is a famous and popular road that runs along the width of Central of Hong Kong Island. You can’t miss it. Also, refer to the map below to locate it easily. Man Mo Temple opens from 8.00 am to 6.00 pm every day. Do note the timings as they strictly close at 6.00 pm. 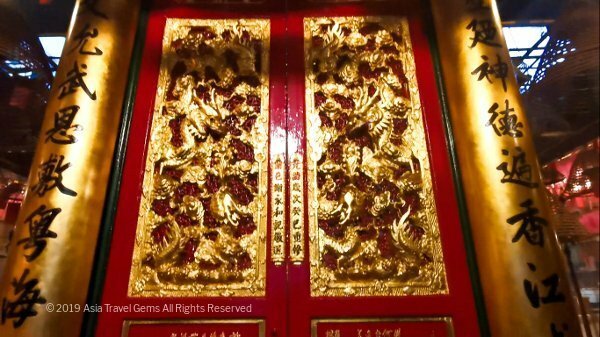 How to Get to Man Mo Temple? You can get to Man Mo Temple from Central Station or Sheung Wan Station. It all depends on which direction you are coming from. If you are traveling from Kowloon, then it is better to stop at Central Station. At Central Station, go to Exit D2. From this exit, turn right to go to Theatre Lane. Then walk along Queen’s Road Central towards The Center. At The Center, walk towards the Central Mid-Levels Escalator, and take the escalator to Hollywood Road. Then walk along Hollywood Road towards the direction of the temple (see the map above). Alternatively, if you find yourself nearer to Sheung Wan, then go to the Sheung Wan MTR Station. Take Exit A2, and walk along Hillier Street to Queen’s Road Central. Go up to Ladder Street that is next to Lok Ku Road, and then to Hollywood Road. Again, once you are at Hollywood Road, refer to the map above to find the way to Man Mo Temple. Bus 26 is the bus that takes you closest to Man Mo Temple. Take this bus from outside Pacific Place at Admiralty to Hollywood Road. Alight at the stop nearest to Man Mo Temple. If you are unsure, ask the bus driver for help. Taxis are easy to catch in Hong Kong. You can get one to bring you direct to Man Mo Temple. For more information about Taxis and Grab, go to my page about Hong Kong. When I was in Hong Kong, I found that I walked almost everywhere. That is, everywhere that is near from one place to another. So, if you happen to be near Man Mo Temple, use the map above to get your bearings and walk over there. Or if you are staying at a hotel nearby, why not walk over and explore this amazing magical place? If you have ANY questions about this post – Things to Do in Hong Kong – Man Mo Temple, or Hong Kong, ANY at all, please submit your questions as comments below. I will be happy to help you out. Thank you for reading about Things To Do in Hong Kong – Man Mo Temple. Wishing you and your loved ones safe and happy travels. With Agoda, You Can Get up to 70% Off! 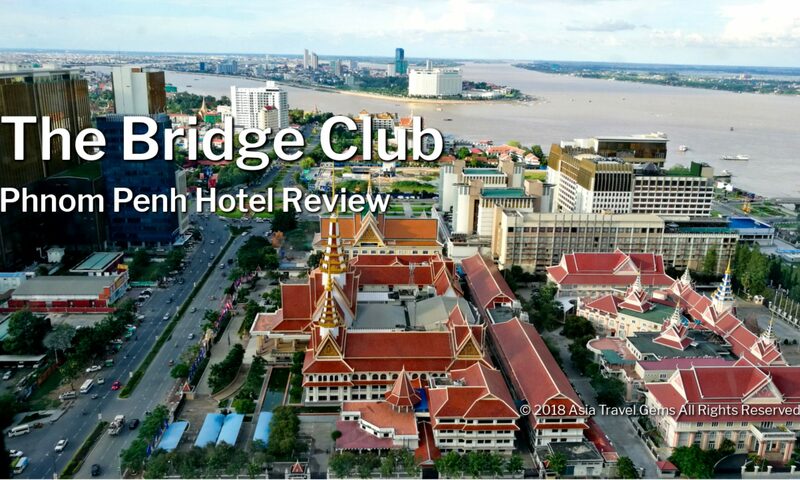 Book Your Rooms Now! Kam Kee Cafe – Awesome Authentic Cha Chaan Teng Food! Timotheus Lee on Things To Do in Hong Kong – Man Mo Temple – A Magical Sight! 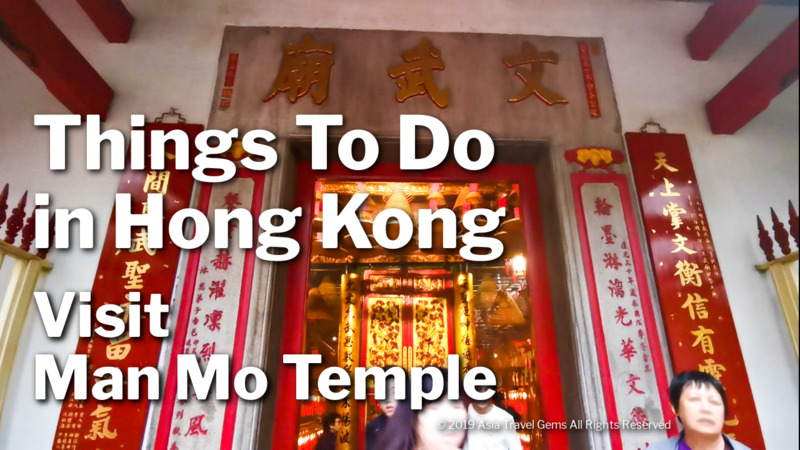 Thabo on Things To Do in Hong Kong – Man Mo Temple – A Magical Sight! Jeff on Things To Do in Hong Kong – Man Mo Temple – A Magical Sight!